Journalists and news organizations have been intensively covering Sunday’s shooting at the Mandalay Bay hotel in Las Vegas. At least 58 people were killed and over 500 were injured as spectators enjoyed a festival of country music. At the core of the coverage has been user-generated content – eyewitness footage of the shootings. The sounds of gunfire and the anxious screams of the festival goers have been replayed on cable and network news broadcasts. These videos played a significant role on Wednesday’s CBS Evening News. The footage was aired continuously without any advisory warning of their graphic nature. The Society’s Code of Ethics reminds journalists to seek truth and report it, but also minimize harm. 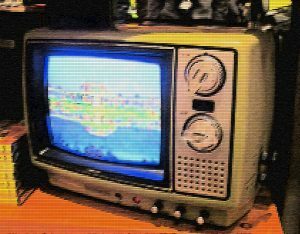 There are arguments for and against the replaying of this footage. On one hand, the footage underscores the gravity of the situation and emphasizes the scale of what happened on Sunday night. On the other hand, the repetition of such videos can be seen as sensationalism – a way to utilize drama and to encourage viewers to stay tuned to the broadcast. Striking the right balance between the necessary and the excess is tricky. Journalists and news organizations usually exercise discretion when it comes to how much of that footage will make up the eventual coverage. Verify the footage before it goes to air. If the video is submitted by social media, take the time to interview the creator and after determining the authenticity how it will help your story. Consider the public when broadcasting footage – and ask this question: “How much is too much?” as you plan your coverage. Be forthright with your audience. If the video is graphic or may upset a viewer, please state that the footage may be disturbing to some audiences, instead of just putting it on the air. Graphic elements are sometimes necessary to tell stories. It isn’t done to scare people or to put them off. Instead, it is to help understand the story and the scale of events. An undue reliance on the footage has an impact on the public – and their relationship with the media. Journalists should – as a result – think twice about using the footage and how it is presented, and be honest with the audience. You’ll ensure credibility and promote quality ethical journalism. Alex Veeneman is a freelance journalist in Minneapolis and a member of SPJ’s Ethics and FOI Committees. The views expressed are that of the author’s and do not necessarily reflect the views of the Committee, the board and staff of the Society of Professional Journalists, or its members. 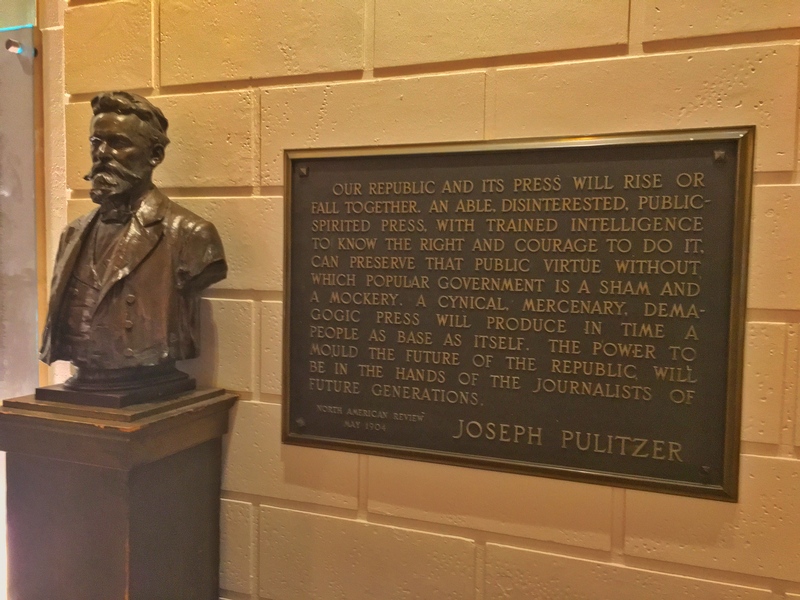 Joseph Pulitzer’s bust is displayed alongside his quote in the lobby of Pulitzer Hall at Columbia University in New York City. That might sound old school or boring but for me it is true: developing, adhering and staying true to journalism ethics has helped me every step of the way throughout my career. When you are adhering to ethical standards you are able to build and keep your community’s trust. As I have moved around the United States pursuing my career, I continue to receive tips from people living in the previous markets I have worked. You may hear those words and think what does that have to do with being an ethical journalist? What’s important to remember about journalism ethics is that it’s different than what is legal. Something that is legal may not always be ethical. If you start to think about the issue of what is legal and what is ethical separately, you’ll begin to see why the words “fair,” “responsible” and “respectful” apply to ethics. Fair is probably the most obvious. At a basic level it means providing all (not just two) sides and individuals involved in the story an opportunity to be heard. For me though it also means going above and beyond to add context to our stories. When you’re putting together stories you are anticipating what answers may be. If you don’t receive those answers from those involved it’s still important to include and explore them in stories. Being responsible means being honest with your users. Telling them when you get something wrong, when you don’t know something, when you couldn’t get answers, etc. Be transparent and let them into the storytelling process. If you receive information after the story airs that changes what the story was about, share that with your users and engage in the debate. As journalists we have a responsibility to inform our communities. Don’t hold back because of sweeps, competition or pride. The old adage, “treat people how you would like to be treated,” has taken me far. That doesn’t mean I back down when there are complaints or pressure from powerful agencies or leaders. It does mean that I always encourage and welcome a conversation about the stories I produce. It means I reach out to individuals named in the story, even if a public information officer has asked me not to. I my team to do the same because I know I would want the same if my name was being mentioned in a story. Being ethical has not always been the easy choice. It’s also not always made me a lot of friends. But, when I have been faced with tough decisions or questioned for the ones I have made, I have been able to defend and standby my choices because I made them based off of ethical guidelines I believe in. So, as the Society of Professional Journalists celebrates Ethics week, I encourage you to revisit your ethics, read our Code of Ethics and develop a set of guidelines you can defend. If you’re an ethical and responsible journalist, more tips will come your way, you’ll produce better stories and you’ll be rewarded with opportunities. Lynn Walsh is the president of the Society of Professional Journalists. 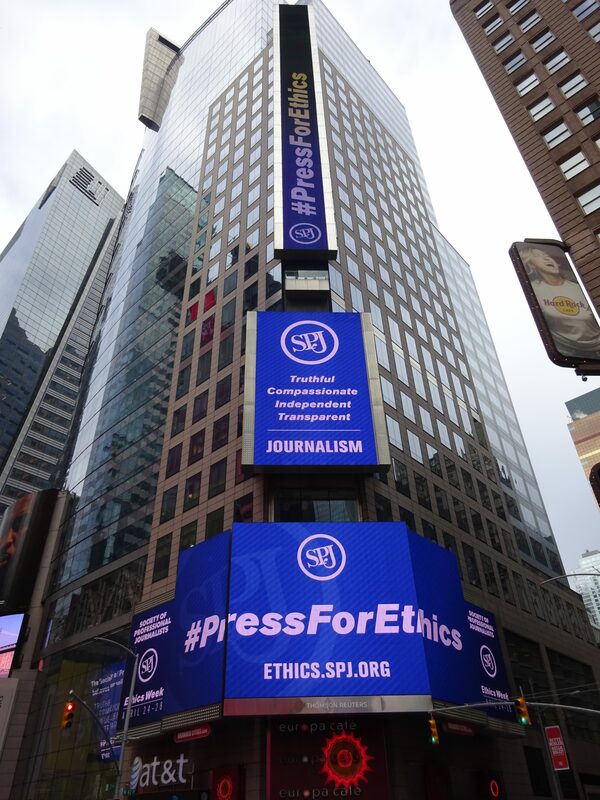 SPJ’s Ethics Week takes over Times Square in New York City on Monday, April 24. After endorsing an ethical code for almost a century, SPJ’s Code of Ethics finally gets its time in the spotlight. The Society of Professional Journalists works every day to improve and protect journalism through its advocacy and education efforts. A big part of that work centers on SPJ’s Code of Ethics, which outlines what the profession views as ethical and responsible journalism. As the President of the United States continues to attack the press and people’s trust in the information it provides continues to wane, SPJ wanted to do something BIG to launch its annual Ethics Week, which runs from April 24 to 28. Nothing is bigger than New York City’s Times Square. Also, no lights shine brighter than those along Broadway. So, the SPJ Code of Ethics and its messages are being displayed this week on nearly 7,724 square feet of digital billboard space in Times Square in New York City. The billboards sit at the intersection of 43rd Street and Seventh Avenue and soar hundreds of feet into the air. The images will periodically pop up on the billboards throughout Ethics Week. In addition to promoting the tenets of the SPJ Code of Ethics, the billboards promote the Ethics Week hashtag #PressForEthics. The hashtag works on several levels. The press is encouraging and advocating the use of SPJ’s Code of Ethics. The press is standing by ethical journalism. Additionally, the hashtag encourages the public to call for responsible and ethical journalism. One of the main goals of SPJ and its ethics committee is to bridge the gap between journalists and the public. The hashtag #PressForEthics creates an opportunity for people to engage with journalists, discuss issues and build relationships. The billboards shining bright over Times Square is just the first big surprise for Ethics Week. Stay tuned to this blog and SPJ’s Twitter and Facebook accounts for more. The Maryland-based Sinclair Broadcast Group struck a deal with Donald Trump during the 2016 presidential election to air interviews with the candidate without added context in exchange for access, according to Politico. Sinclair, which owns television stations across the country, made the offer to both candidates, Politico reports. Sen. Tim Kaine, who was former Secretary of State Hillary Clinton’s running mate, reportedly participated in a few of these interviews. “It was a standard package, but an extended package, extended story where you’d hear more directly from candidate on the issue instead of hearing all the spin and all the rhetoric,” a Sinclair representative told Politico. While Sinclair’s explanation may sound reasonable, such agreements hurt other journalists, the integrity of Sinclair’s broadcasts and the quality of information received by viewers. Most worrisome is that agreeing to air extended interviews with candidates without added context shackles journalists and allows candidates’ statements to go unchallenged. Essentially, Sinclair turned over editorial control to the candidates. Sinclair viewers may end up misinformed if Kaine or Trump, who is now president-elect, misstated facts during those interviews. Journalists at Sinclair-owned stations may have wanted to correct the record after the interviews aired, but were not allowed due to the agreement. These agreements also end up increasing the number of barriers for all journalists covering the presidential election, including those at the news organization that made the deal. Access to a candidate is already a valuable commodity, and news organizations often try to woo campaigns to pick them for interviews or responses. News organizations increase the value of that access by giving a candidate access to readers, viewers or listeners with less and less restrictions. A news organization can start a bidding war with others for more pleasing terms. If the campaign finds an organization offering better access to potential voters, they may come back to Sinclair for less restrictive terms. 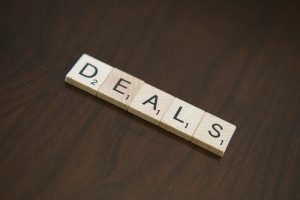 People may argue that these deals make sense given that journalism is a business, but it’s a unique business. Journalism is based on principles, which are outlined in the Society of Professional Journalists’ Code of Ethics. Sinclair should have – at the very least – told their viewers about the agreements made with Trump and Kaine. The Trump campaign told Politico that it made similar deals with other broadcast groups, such as Hearst Television. The organization denies any deal existed. 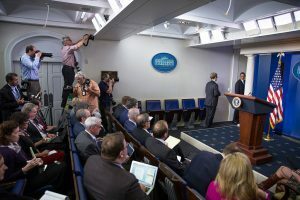 All news organizations must recommit themselves to journalism’s basic principles as they move forward in an unfamiliar environment, where the president-elect and his administration is openly hostile toward the press. Cutting backroom deals to give politicians unfettered access to a news organization’s readers, viewers and/or listeners is not among those principles and is not in the spirit of SPJ’s Code of Ethics. Additionally, journalists must speak up when their news organizations engage in ethically questionable activities. If speaking up may put their livelihoods in jeopardy, the journalists are welcome to reach out to SPJ’s ethics committee. We need to hold the proverbial feet of news organizations to the fire as much as we do politicians. Andrew M. Seaman is the ethics committee chairperson for the Society of Professional Journalists’ ethics committee.